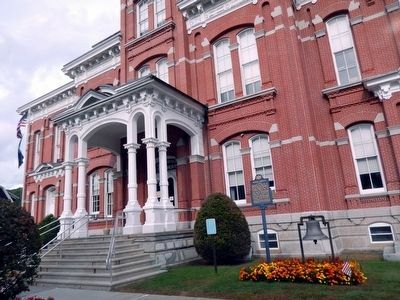 Formed on March 21, 1798, from Northampton County. Named for Gen. Anthony Wayne. 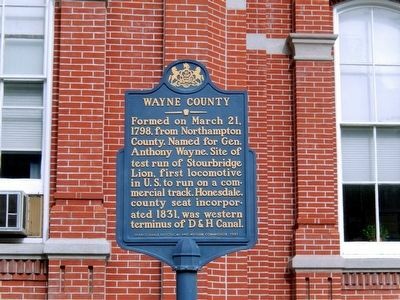 Site of test run of Stourbridge Lion, first locomotive in U.S. to run on a commercial track. Honesdale, county seat, incorporated 1831, was western terminus of D & H Canal. Erected 1981 by Pennsylvania Historical & Museum Commission. Location. 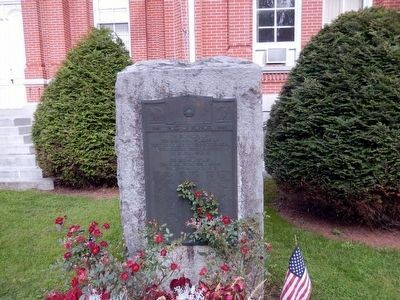 41° 34.473′ N, 75° 15.244′ W. Marker is in Honesdale, Pennsylvania, in Wayne County. Marker is on Court Street. Touch for map. 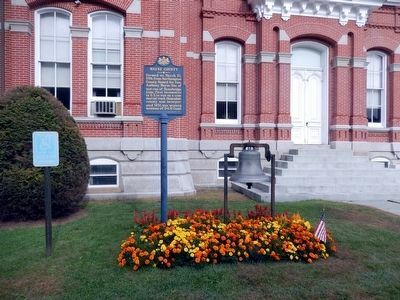 The marker is on the lawn of the Wayne County Courthouse. Marker is at or near this postal address: 925 Court Street, Honesdale PA 18431, United States of America. Touch for directions. Grace Episcopal Church (about 400 feet away); Senator Kingsbury House (about 400 feet away); F. M. Crane House (about 400 feet away). Touch for a list and map of all markers in Honesdale. In honor of the men and women of Wayne County, Pennsylvania who served their country in World War II and in memory of the following who made the supreme sacrifice. More. Search the internet for Wayne County. Credits. This page was last revised on June 16, 2016. This page originally submitted on October 8, 2015, by Don Morfe of Baltimore, Maryland. This page has been viewed 250 times since then and 4 times this year. Photos: 1, 2, 3, 4. submitted on October 8, 2015, by Don Morfe of Baltimore, Maryland. • Bill Pfingsten was the editor who published this page.